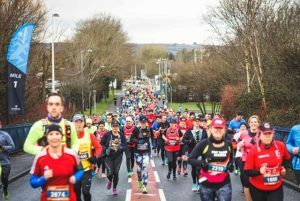 The third edition of the Llanelli Half Marathon (Sunday 10th February) since Front Runner Events took over the race was an overwhelming success with a record number of runners taking on the 13.1 mile sold out race. The race sold out back in November, before organisers announced a new route for 2019. The new route remained fast and flat but showcased more of Llanelli to the runners as they ran to Pwll via the Coastal Link Road and Sandy Water Park. Record numbers of runners of all abilities took part; first timers, club runners, charity runners and a strong elite field, making it clear to see why the 2018 edition of the Llanelli Half Marathon had been voted the Best Half Marathon (<5000 participants) at the UK Running Awards. The half marathon started at Parc Y Scarlets taking runners along the Coastal Link Road through the beautiful Sandy Water Park before linking up with the Millennium Coastal Path (MCP) towards Pwll, where the runners turned and headed back towards Machynys before exiting the MCP onto the B4304 and finally back onto the A484 to finish at Parc Y Scarlets next to the iconic Ray Gravell statue. Spectators lined the route despite the challenging weather to cheer on the runners as they took on their 13.1mile challenge, as well as cheering them across the Finish Line. Richie Powell took the crown of the inaugural Wheelchair Winner in a time of 01:19:37. There was a strong men’s field attracting runners from across the UK. 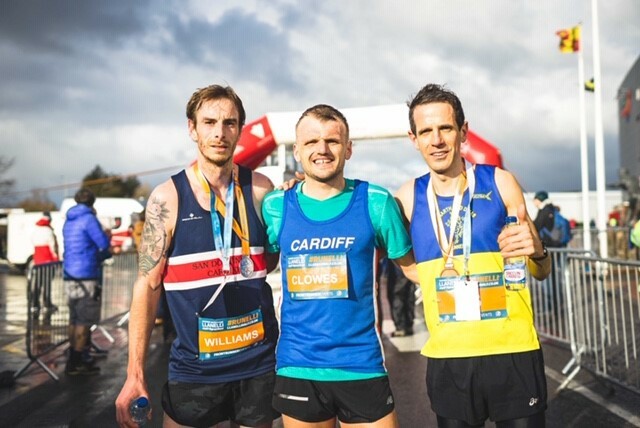 The title was reclaimed by Matthew Clowes of Cardiff AAC with an impressive time of 01:06:44, finishing well ahead of the rest of the field. Luke Williams of San Domenico RC was the next male home in a time of 01:12:00, shortly followed by Ben Butler-Madden from Penarth & Dinas Runners in a time of 01:13:32. The women’s title was retained by 2018 winner Caryl Jones of Swansea Harriers with an impressive time of 01:17:05. Lucy Marland of Cardiff AAC was the next lady home in a time of 01:20:22 and third place went to Megan McBrien of Royal Sutton Coldfield AC with a time of 01:22:35. Local running clubs provided a team of race pacers helping many runners achieve their PB and hitting their target time on the day. The fully marshalled race on closed roads included water stops (thanks to Hydration Partners, Brecon Carreg), energy gels, bespoke medal and goody bag delighted all race finishers. Runners were also able to benefit from a pre/post-race massage from Gower College Swansea. The winning team of the 2019 Corporate Challenge went to JCP Solicitors who were amongst teams from Parc Y Scarlets, Glamorgan Brewing Company, Brecon Carreg, St John Lloyd Catholic School, Roger Casey Associates and Carmarthenshire Actif Sport & Leisure. “We are absolutely delighted to have quadrupled the field of runners since taking over the race. To have the race sell out for a third consecutive year is fantastic, this alongside being able to announce a new route which takes in more of Llanelli has meant we can look to increase the field going forward. It’s been fantastic to s ee Matt Clowes and Caryl Jones retain their 2018 crowns, as well as Richie Powell being our wheelchair champion. I would like to thank each and everyone of our 150 or so volunteers who have helped us create a special day. Without the help of the volunteers it would be far more difficult for us to hold events such as this. 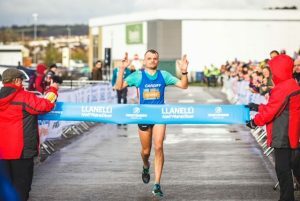 The organisers are currently confirming the date for the 2020 Llanelli Half Marathon; however it will definitely take place in February once again. Registration is already open and people can sign up to #RunElli via the website. 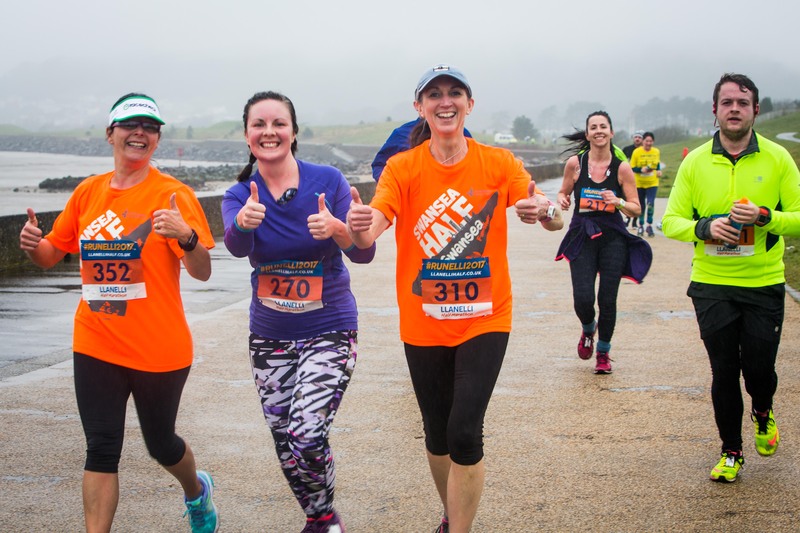 Standard entry fee for the 2020 race is £31 (+booking fee), or £29 (+booking fee) for affiliated runners. 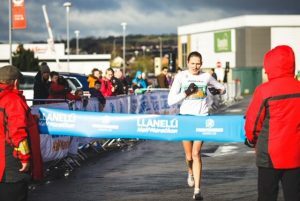 Go to www.llanellihalf.co.uk for further details, full results and to sign up for the 2020 race. You can also like the Facebook page www.facebook.com/llanellihalf/ and follow @LlanelliHalf #RunElli #BeYourBest on Twitter and @Llanellihalfmarathon on Instagram.